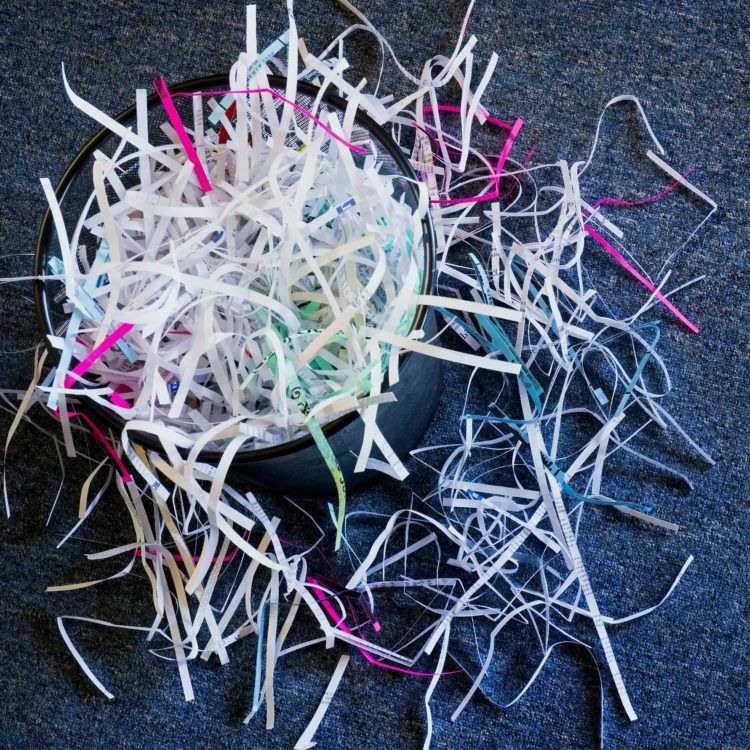 You might be surprised how many uses for shredded paper there are. Because it usually can’t be recycled, it’s nice to find a way to use it more than once before disposing of it. 3. Use it as animal bedding, or donate it to a vet, animal shelter, etc. I shred a lot of paper nowadays to protect my identity. While I’ve stopped my junk mail almost completely and get most of my business correspondence and statements by email, I still find myself shredding a lot of documents with identifying information on them. By the way, I use this Sentinel cross-cut micro-shredder which is much better than other ones I’ve owned. It’s lasted about 6 years so far, never jams, and still shreds like it’s brand new. The problem is: all this shredding produces bags and bags of trashed paper. 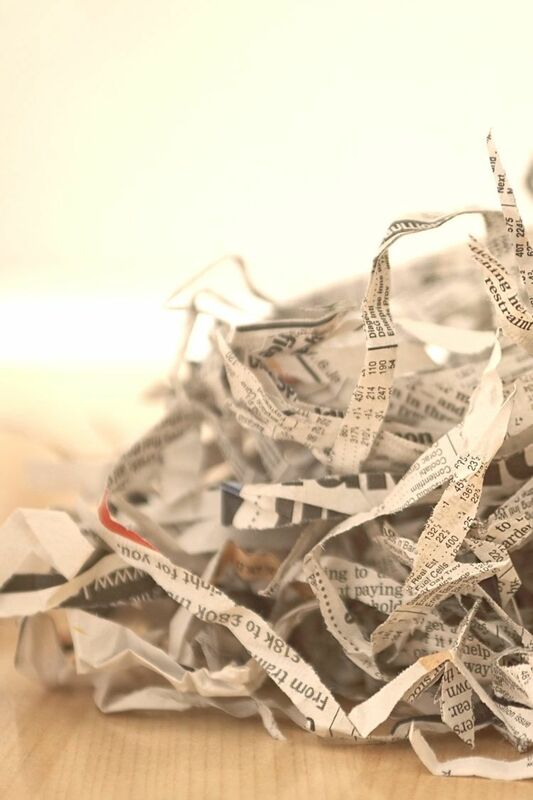 Most recycling centers can’t do anything with thoroughly shredded paper. Some can handle long thick shreds, but how secure are those? The environmental rule is: “reduce, reuse, recycle.” I’ve reduced my shredded paper by getting fewer documents in paper form to start with. As for recycling, there is actually a viable option: put (some) shredded paper in your compost heap, if you have one, or someone else’s if you don’t. This is the most environmentally friendly solution. Consider it “brown” waste and put an appropriate amount into your heap, then let the microorganisms and/or worms in the soil do the recycling. Note: don’t put glossy paper or cellophane from envelope windows into your composting. Those aren’t biodegradable. Don’t worry if small amounts of them end up in your compost heap, because you can pull them out later when you go through the composted soil. 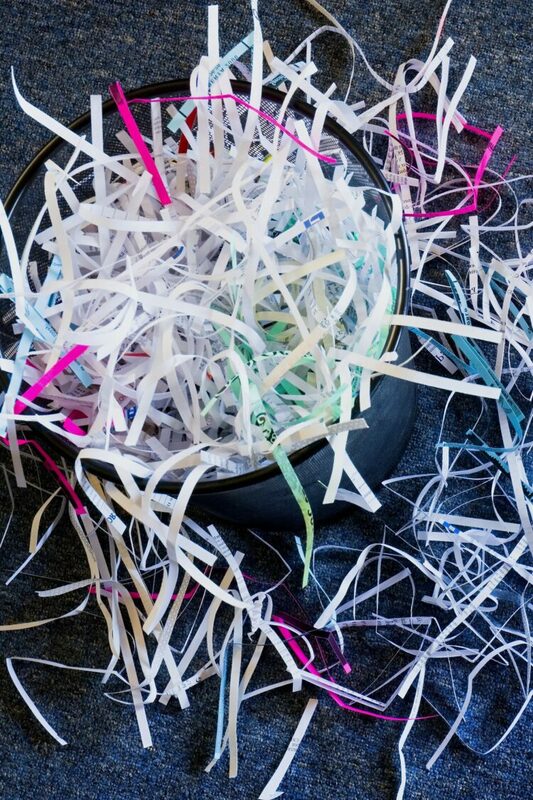 Chances are you won’t be shredding much of either of these. That’s reducing and recycling covered. Now if we can just find some uses for the shredded paper before we resort to composting it! Delicate china, expensive electronics… shredded paper beats styrofoam popcorn because you can pack it tightly into those areas where you’re afraid something will rub, bump or shift. Use it for mailing items. Use it for packing stuff you’re going to put in storage. Seriously, I’ve used it for moving long distance a couple of times. Obviously, it can get messy, but here’s a simple solution: bag shredded paper in Ziplocs or other plastic bags – it works just like those plastic air pillows some companies use to ship goods. You or the recipient (if it’s a gift) can then reuse the whole shredded paper “pillows”, or take the paper out for the compost heap and just reuse the bag. Most essential oils will overwhelm the scent of most papers, so you can tie up scented paper shredding in something (bonus points if you use a recycled coffee filter), and voila – a nice little sachet to use or give away. Note that some paper and ink materials can be toxic to some critters, so get some advice before exposing your pets (or anyone else’s) to something that might hurt them. Pad your litter box with shredded paper before putting the crystals on top. The crystals still do their work, but you need fewer of them. Very smart! 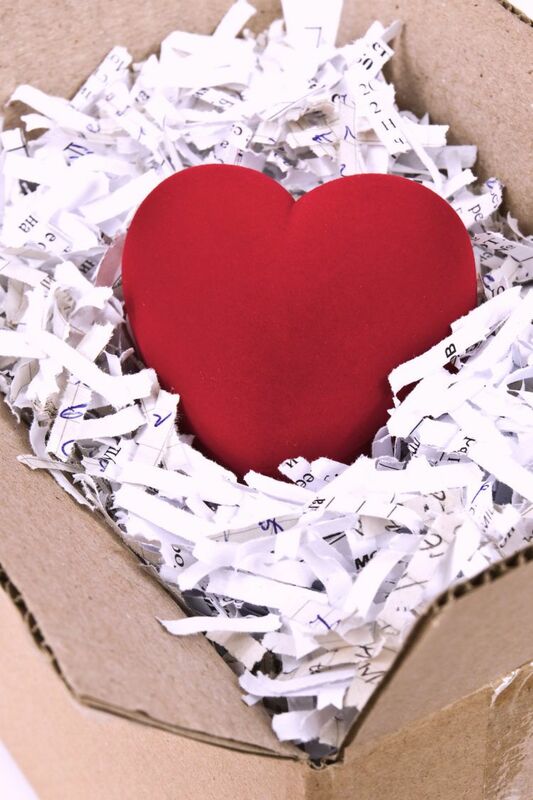 Recycle your shredded paper into homemade sheets of paper, which are great for correspondence, scrapbooks, gift tags, etc. You can buy a paper making kit that makes it very simple, and the results are often beautiful. Add flour and water (equal parts) and you’ve got papier mache for art projects. You can plant shredded paper directly as mulch around trees and gardens. The soil microorganisms will “eat” the paper the same way they would in a compost heap. Got a wedding or a celebration coming? Toss shredded paper instead of rice or confetti. If you’ve got a scarecrow, you can stuff it with shredded paper instead of straw. You can also stuff kids’ costumes with it, if they need some extra padding. Encourage them to get creative. One really good use of shredded paper is to make sculptures or raised pictures with it, dampening it slightly to keep the shreds where they belong. Then you can use spray-on gesso or another finishing agent to freeze them permanently in place. When you’re making an artificial arrangement, you can stuff some shredded paper into the vase as filler so you won’t need to use as many floral pebbles or other vase fillers. * the salutation, account number in the subject line, etc. I keep a manila envelope marked “To Shred” & tuck all the bits and strips to be shredded in there. It usually takes weeks before I have enough to even bother running the shredder. Documents with a blank side get ripped according to their fold–either thirds or halves–and get added to piles, by size, on my “scratch paper shelf”. I make scratch pads by stapling a bunch together, blank side up. I often create quarter-sheet scratch pads from the half sheets. The remaining bulk of the letter, envelope, etc. goes directly into the recycling bin. Any used scratch papers are quickly checked for personal data before going into the recycling bin as well. So you see, you don’t need to shred the entire document–it’s just the personal information you want to remove and that can be done quickly and easily. Hello, I have two guinea pigs. I shredd up A4 pack of paper and it makes a great bedding for them, But it gets abit yucky when they pee on it. It goes all yellowly. But my daughter marley that is 3 months old is beautiful. she has shredded stars ontop of her ceiling, I cut out stars on cardboard and glued some pink and purple shredded paper to them. There hung on there ceiling with some string. Ive recently had new grass put in and some lemon tree’s. We couldnt get mulch so we used shredded paper. I hope you enjoy your shredded paper creations. It’s great if you don’t have a ton of shredded paper on hand and want to do something simpler with it. I like the packing with it idea. I also use it in my compost and layer it with cedar shavings in my chicken coup. The layering helps keep them warm in the winter then I clean it all out in the spring and put in my compost pile. The reason Im looking for more ideas is because I have 4 giant garbage bags full of our business docs and wanted more idea’s. My kids are grown so no crafty idea’s are useful. I may just dig up my veggie garden and lay the paper on the bottom of my raised garden then move the dirt back on top….in the past using directly in my garden on top created mushrooms, mildew crawly white stuff..if they were edible then that would be super! I recently started using shredded paper as kitty litter. Nothing special necessary, just shred it and put in the box. I replace it as needed, usually once or twice a day. I get rid of solids right away because I can’t stand it, but I did that when I used litter anyways. I love it. It’s free, light weight, eco-friendly (unlike clay litter which is horrible for the environment and very unhealthy for animals and people), and there’s barely any smell since I’m changing it often. It sounds like a lot of work, but it’s not. You can seal it up in a plastic bag until you’re ready to take it out or I put it in the compost bin. (they say you’re not supposed to, but since it’s a small amount and urine only I do it anyway.) I don’t have a shredder so I just cut up some newspaper, but I live in an apt. and sometimes I find already shredded paper. That’s a terrific idea! Thanks for sharing that. I fill Toilet Paper Rolls with it, Then Pour Melted Wax on Ends to seal it in I Roll the Whole Tube in Wax. Great Fire Starters for Camp or Fire Pits.this is the quick Way. The Longer Burning way is Roll Tube in Bacon Grease store in Bag or Tote till Ready to Fill. Then I roll Whole Tube add Shredded Paper then Pour Wax on the Ends.to Seal the Paper in a LIL Better. :) :) .Been doing this for Years. Can Fill with Dryer Lint Also. This way Grease is being Recycled T.P.Rolls Shred Paper Lint. Also can do this with used P.Towels/Napkins, P.Plates , Just get Creative.